Dirty Little Secrets: why buyers can’t buy and sellers can’t sell and what you can do about it. Sales is a failed model: there is only a 10% success rate. Some industries have even less. Why? It’s not about the sales person – the seller does a great job understanding need and presenting a solution. It’s not about the product – the product is perfect, well-priced, and branded. And the buyer’s need is a perfect fit for the seller’s solution. 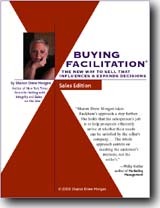 In Buying Facilitation™, the new way to sell that influences and expands decisions Sharon Drew Morgen introduces us to her Buying Facilitation™ Method, including the Buying Decision Funnel vs. the Product Decision Funnel. It introduces Facilitative Questions, systems listening, Presumptive Summaries, and how a conversation gets created. It gives the reader the understanding of concept of a buying decision rather than a sale, shows why sales is insufficient, and then leads the reader meticulously through the phases of how buyers decide. It offers two Case Histories to introduce the Method, and specifics of how and when to apply the model. Sellers are good at pitching product, understanding need, and designing a solution for a customer. But why don’t more buyers buy? Why is there a 90% failure rate? Because sales only manages 1/2 of the the buyer’s buying decision; the other half is done in-house, and hanldes all of the internal issues that need to buy-in before the culture can change. This is Morgen’s introduction to her Buying Facilitation™ model, and stresses the seller’s responsibility as a servant leader. The buyer has to do this end of the sales cycle anyway. Selling with Integrity makes the case that if the seller can be a part of the buying decision team, the buyer will close much faster and the seller will already be part of the team, thereby eschewing objections and competition. Sales on the Line Sales On The Line: Meeting the business demands of the 90s through phone partnering. 1992, Metamorphos Press. Sales on the Line is a mixture of a phone sales book and a servant leader manifesto. The first book by Morgen, this book introduces her visionary sales thinking that buyers buy only when they can figure out how to engage the people and policies that developed the ‘need’ to begin with. She introduces a model that uses the telephone to help engage prospects and clients, and makes sure that every interaction is win-win. And by following one story through the entire book, Morgen builds the reader’s learning one idea at a time. This book has been translated into several languages and is still in print! The New Sales Paradigm Series The New Sales Paradigm Series: Changing the Thinking, the Process, and the Skills in Sales.